Retro Gas Pumps are hot and ABC Billiard Plus offers you this 71” tall Red Billiard Gas Pump. This great addition to your game room is hand finished and painted on solid wood. 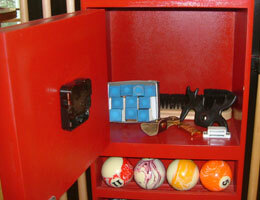 It holds 6 pool cues, your favourite pool ball set and hidden behind the battery operated clock is a storage compartment for your chalk, bridge head, brush and other pool table accessories. 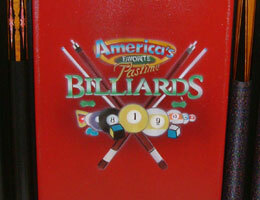 Colorful graphic says “America’s Favorite Pastime Billiards” and the “Billiards” crown at the top lights up when plugged into your wall outlet. *Beyond or Indirect Point destination charges may apply. **Shipping charges are for either a local terminal pickup or delivery to a business address in a business district. Residential surcharge of $100 applies where available.